My love for this unique pastry was born while I was in college. Each holiday, my synagogue would mail care packages to our dorm rooms; during Hanukkah we’d get miniature menorahs, on Passover we’d get matzo, but for Purim we’d get hamantaschen. ‘Hamantaschen‘, Yiddish for ‘Haman’s pockets’, are triangular shaped pastries typically filled with fruit marmalade, cheese or poppy seeds. 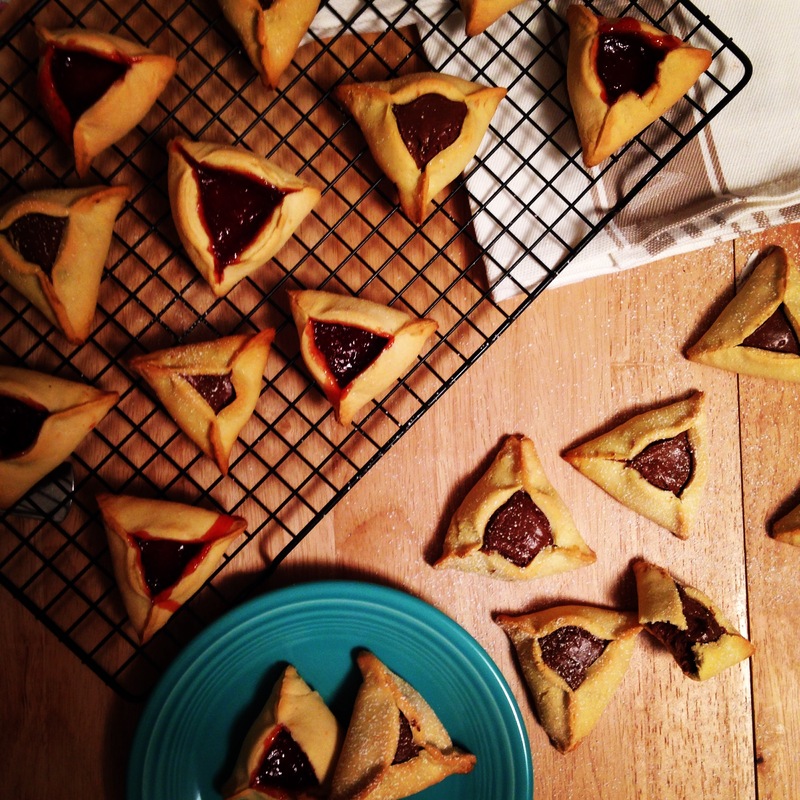 Though there are multiple explanations for the shape of these pastries, the one I hear most often is Haman, the villain of Purim, wore a three-cornered hat. Enough history for today, let’s get to the recipe! 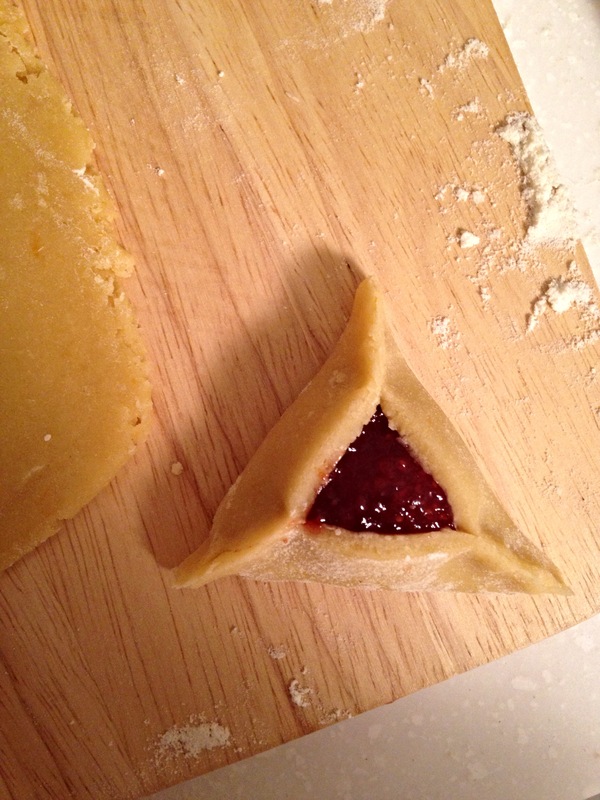 While I’d love to recreate the exact hamantaschen sent to me in my college care package, I don’t know what it is! That being said, I turned to my friends Pinterest & Google to find the most traditional recipe possible. Most recipes contained lemon zest and juice, although I remember my dad confirming these cookies were typically made with orange rather than lemon. Naturally, I made a few tweaks to a great recipe I found & came up with these beauties. Be creative with your filling. 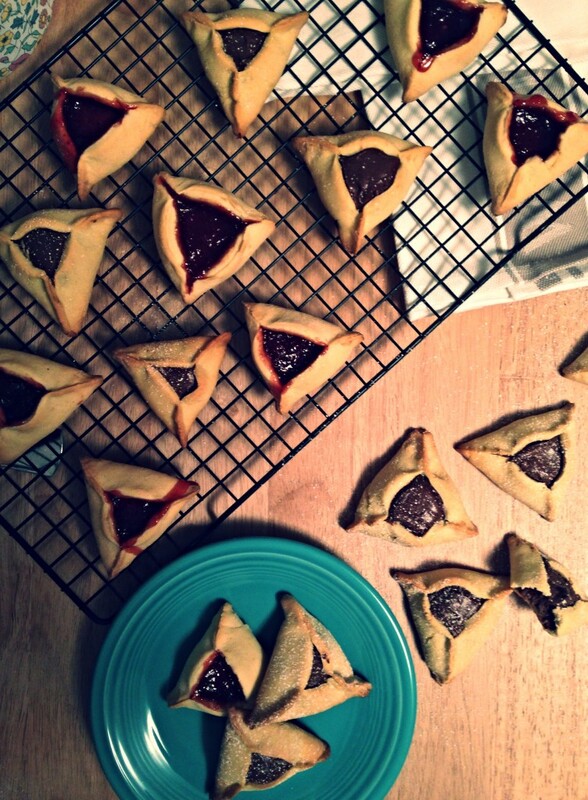 While I love how traditional these cookies are with fruit marmalade, I thought it would be fun to give some of my hamantaschen a make-over by adding Nutella to the center. I was absolutely NOT disappointed. Use your imagination! This morning my co-workers and I decided blueberries, lemon & poppy seed, or peanut butter & fluff could also be the perfectly delicious fillings. Give yourself time. 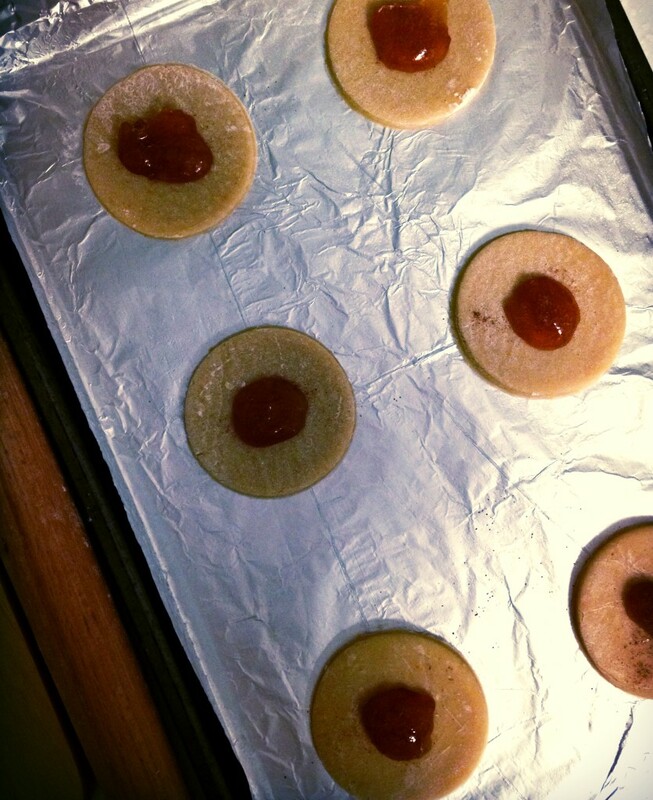 Like other cookies that need to be rolled out & cut, it’s best to refrigerate the batter for at least 1 hour. 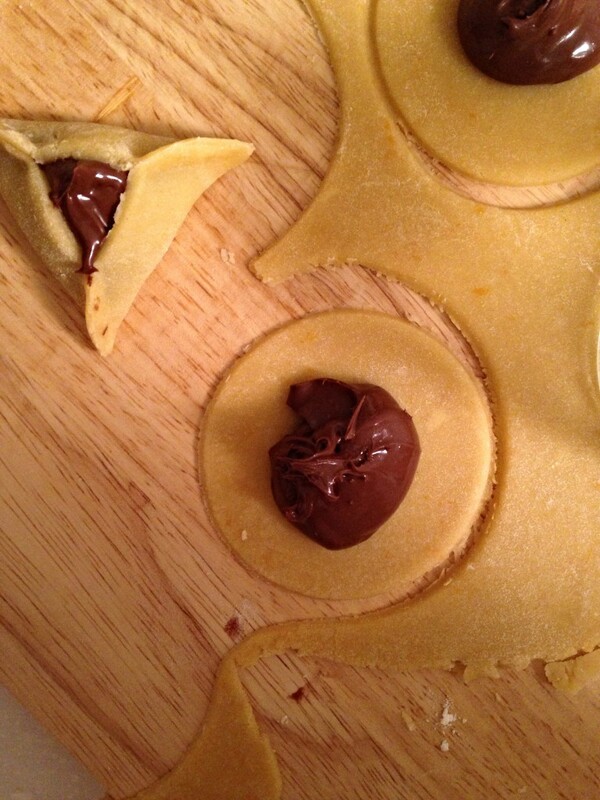 This will allow them to keep their perfect, triangular shape while they bake. In a large bowl, sift together the flour and baking powder then set aside. In a large bowl or stand mixer with the paddle attachment, beat the eggs, oil and sugar until completely combined. Add the vanilla, oil, orange juice and zest, and beat until completely combined. Very slowly, add the dry ingredients in small batches - to keep the mess to a minimum. Once completely combined, dump the batter on to a well-floured counter-top or cutting board. 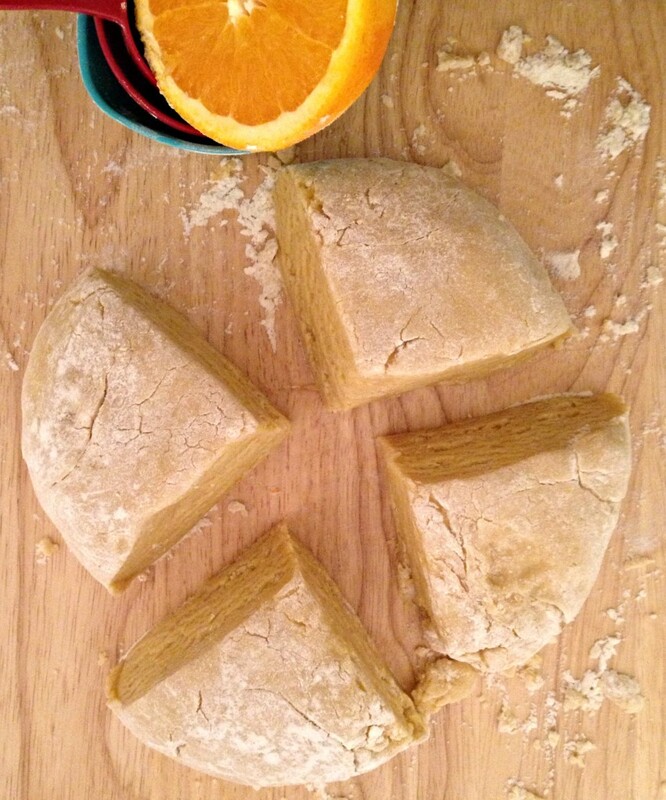 Shape the batter into a large ball then divide it into 4 equal wedges. Roll each wedge into a disc, then individually wrap each disc with plastic wrap. Place in the fridge to cool for at least 1 hour. 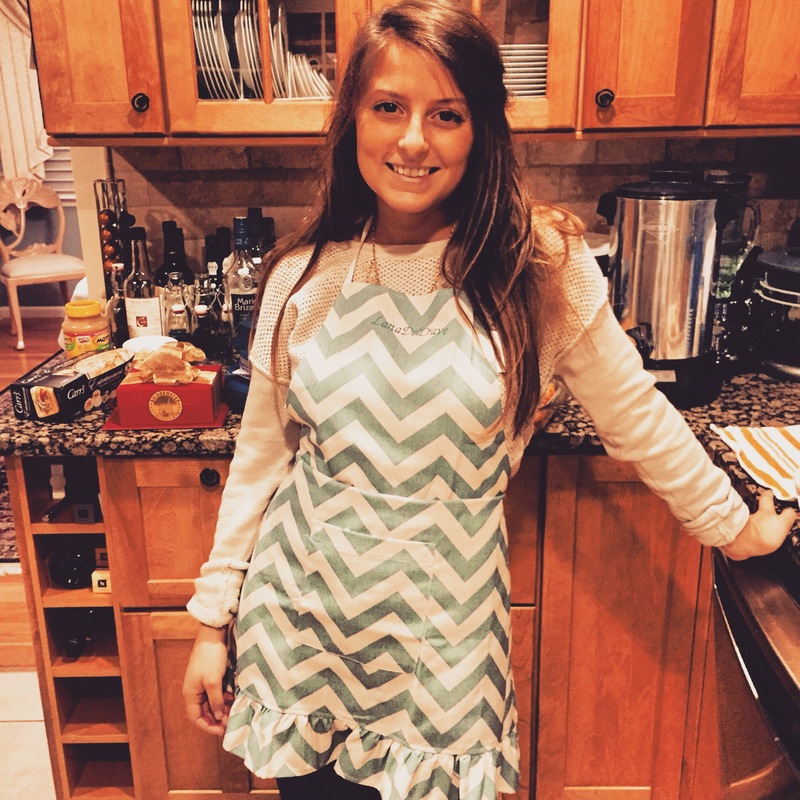 While the dough is cooling in the fridge, preheat the oven to 350 degrees. Lightly grease two baking sheets with all natural cooking spray (preferably vegetable oil, but canola will do just fine). Set aside. On a well floured board using a rolling pin, roll each disc (one at a time) to about 1/8-inch thick. 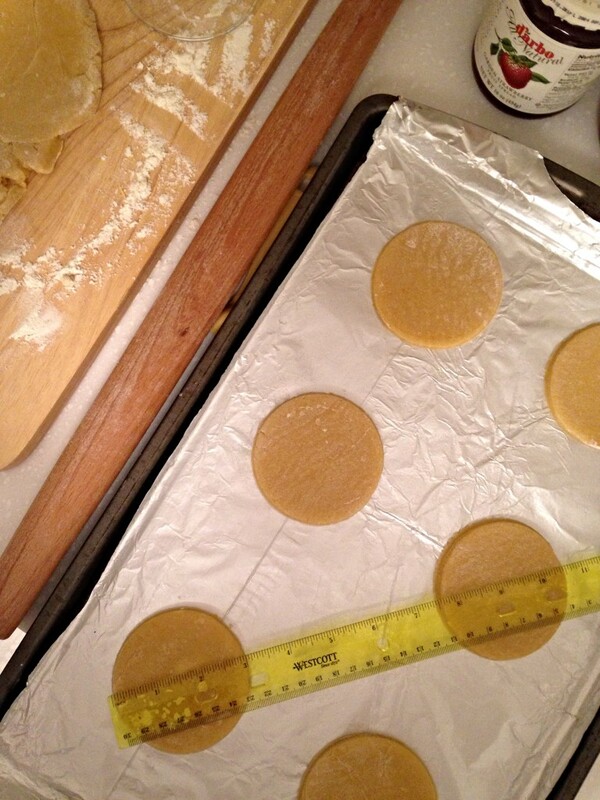 Using a round cookie cutter - or a cup, if you don't own a round cookie cutter - cut circles, 3-inches in diameter. 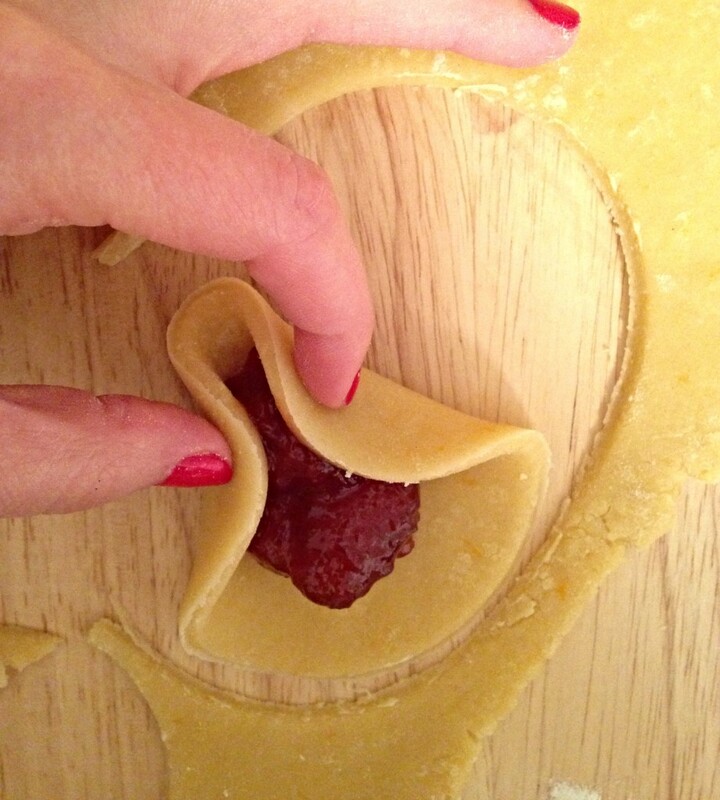 Add 1/2-2/3 teaspoon of desired filling in the center of each circle. NOTE: While strawberry preserves & Nutella filling can stand alone, I like to sprinkle ground cinnamon atop the apricot preserves to give them an added layer of flavor. 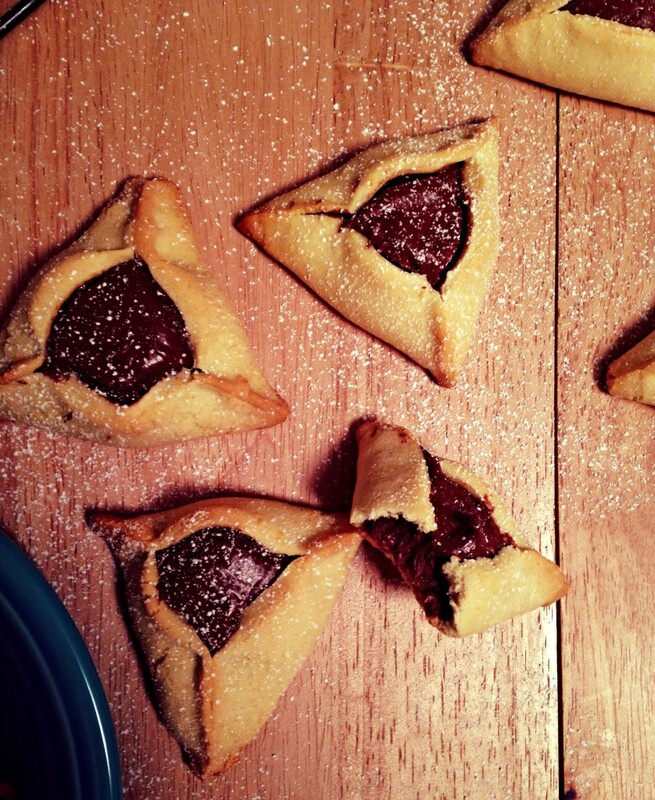 Feel free to omit this step and simply add a plain dollop of apricot preserves to the center of each hamantaschen, the way you would with the strawberry preserves and Nutella filling. To shape the triangle, lift two sides, leaving the third down, and bring the lifted sides to meet at the center above the filling (see above photos). Pinch the two sides together to make one 'point'. Next, bring the third/final 'flap' to the center, and pinch the final two 'points' together, tightly. You should be left with a perfect triangle. 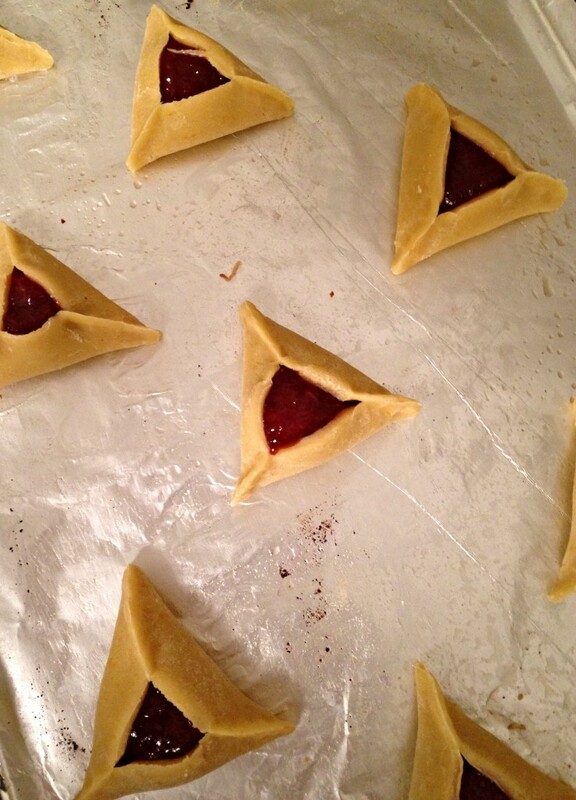 Place the hamantaschen on the prepared cookie sheet 1 inch apart and bake for 12-15 minutes. You'll know the hamantaschen are baked perfectly when the edges become golden brown. Let cool completely before enjoying.